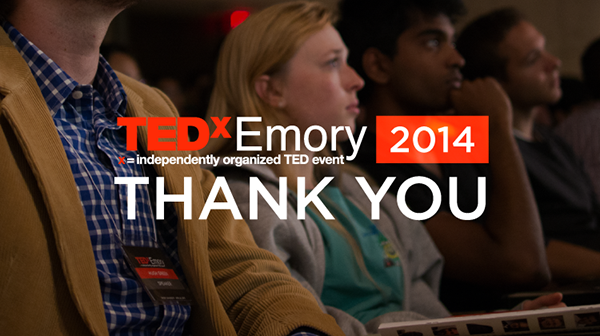 The 4th TEDxEmory was held at the Robert W. Woodruff Health Science Center on April, 12, 2014. In each of our workday actions, it’s easy to become so caught up with the to-dos that sometimes we don’t notice all the little treasures around us across this beautiful campus. I recently learned about the TEDxEmory conference – a gem right here in our backyard – through an article in the Emory Report. After consistent growth, the Emory Team hosted its 4th TEDxEmory at Robert W. Woodruff Health Science Center on April, 12, 2014. The founder of the TEDxEmory back in 2011, Ishaan Jalan, along with a group of students and the executive board organized its first talk and licensed their name from the original, independently organized TED events. In keeping with the original format the TEDxEmory Speakers’ topics are well-balanced, diverse and fast paced so you don’t have to invest a lot of time. So to all LITS readers who are devoted TED Talks listeners, TEDxEmory has an impressive and powerful lineup of presenters all with a wide assortment of compelling subjects that you will want to hear. I became a passionate TED (Technology, Entertainment, and Design) follower last year, while working through the Management Development Program. During the curriculum, we studied several memorable TEDtalks so that we could learn how to recognize a speaker’s star moment and how to detect their call for action statements. Inevitably during a Manager’s presentation, we could count on one of the Directors to ask the group to identify the speaker’s star moment. Insights from Jill Bolte Taylor, Susan Cain and Amy Cuddy remain some of my favorite TEDtalks because each shared their personal stories with so much courage and humor. Even today each topic still resonates with me! So if you’re an avid TED fan and love a good talk, I’m sure you’ll enjoy these TEDxEmory speakers’ videos and you might even learn to watch intensely for these community speakers’ star moments to emerge! Meanwhile, I’ve already found one truly transformative subject here that’s worth spreading. I can hardly wait to see the new 2014 speakers’ presentations uploaded! This entry was posted in News and Events and tagged Enterprise Services, TEDTalks, TEDxEmory, TOC. Bookmark the permalink. Post a comment or leave a trackback: Trackback URL.